There’s no better way to learn how to create comics than learning from the pros. Writers like myself can grab books from Denny O’Neil or Scott McCloud. Artists can learn How to Draw the Marvel Way or attend fancy joints like the Center for Cartoon Studies or the Savannah College of Art and Design. But what if you want to color? What is the essential text for that corner of the industry? Last year I thought I’d see what the coloring process was like. After doing a bit of research, I found out that the universally loved tome on the subject was called Hi-Fi Coloring for Comics…which was out of print and selling for a fortune on Amazon. Drat. Luckily a friend lent me a copy, and I started applying the book’s lessons immediately. “But when would a new edition be released?,” I wondered. Well, I need wonder no further! A Kickstarter was launched, met its goal, and has just 48 hours left! that will pave the way for an all-new version of this revered and sacred text! I thought I would chat with Brian Miller, Hi-Fi founder and co-author of the book in question, to see what he could tell us about his journey as an artist and the Kickstarter itself. Matt: I always love asking creators how they got exposed to comics, because I think it says a lot about where their creative passions take them. How did comics become a part of your life? Brian: I can’t think of a time that comics weren’t a part of my life. Even before I could read, I would watch Super Friends, play with my Batman and Spider-Man toys or color in a giant-size Superman coloring book I received as a birthday gift. I grew up on GI Joe, superheroes, and Star Wars. I’ve been lucky enough to curate those same properties as an adult, and hopefully help the next generation discover a passion for them as well. Matt: As an artist, it must be a thrill to make an impact on an “official level” with your influences, contributing to the tapestry of their canon. But I’m curious about how that came about. How did you start down the path to become a colorist? Brian: In the early 90’s I met an artist named Brian Rice, and he introduced me to his character, Captain Crafty. We put our heads together along with inker, David Bryant and the three of us started making comic books. Captain Crafty was one of the first small press comics to be colored digitally and published in full color. Image was pretty much the only publisher with digitally colored comics at the time so what we were doing was pretty much unheard of. We went to Chicago Comic Con along with some other creators and the first handful of issues we had created. We were lucky enough to have our booth positioned near the exit of Todd McFarlane’s “Spawn Alley”. As hundreds of fans stepped back onto the show floor we were there to show them Captain Crafty, Walt the Wildcat, Planet 10 and other comics the group of us had created. Fortunately, many fans liked what they saw and purchased our comics. Comic cons were not as busy then as they are now, so I had plenty of time to see the show, hang out, and make friends with other creators and show them the comics I had colored. Before I knew it, people were asking me to color their covers, pin-ups, and trading cards. I spent the next 5 years or so coloring a variety of small press projects. Matt: You also were involved with other big names as well, and fairly early on. What were some of those first “big league” jobs? Brian: I colored a few pages of Rob Liefeld’s incredible Cable vs. Wolverine artwork for Cable #75. That was the first high-profile mainstream comic book I worked on. The editors at Marvel were very impressed with the work, and within a few months the other colorists at Hi-Fi and I were coloring Cable, Wolverine, X-Men, and a variety of other titles for Marvel. That same year I started coloring covers for Terry Moore’s Strangers in Paradise. Terry is one of the smartest and hardest working creators I have ever worked with. I’ve learned a lot from him over the years and am honored to count him among my friends. Matt: How did the group at Hi-Fi come about? Did you all start out as colorists? Brian: When I first founded Hi-Fi, we had a couple of pencilers, inkers, a letterer and layout person, and I was the only colorist. We worked on many small press comics and picked up the occasional cover gig or trading card project too. Hi-Fi connected with a company called New Breed and we started inking & coloring their comic book. It was a bi-monthly series, and I brought in a few other colorists to help me stay caught up. New Breed took us with them to San Diego Comic Con in the mid 90’s, and there I had the opportunity to meet many creators and publishers. After that, Hi-Fi started receiving coloring jobs from Marvel, Dark Horse, Chaos!, Crusade, Abstract, and others. When Hi-Fi moved from Kansas City to Arizona in 2001, I didn’t hire any pencilers or inkers and decided to focus our efforts 100% on color and then things really took off! Matt: How did your wife Kristy become a part of your world of color? I always love hearing about spouses collaborating on comics! Brian: Hi-Fi was growing so quickly, I could not keep up with the creative work and business work. I told Kristy I was thinking we may need to hire an office manager and after much deliberation she agreed to take on the role herself. It was the best thing that’s happened to Hi-Fi. Kristy runs the business much more efficiently than I ever could. The editors, clients, and other creators all love her, and because of Kristy, Hi-Fi has grown in ways I could not have imagined. With her help I’m able to stay focused on the creative work, as are the other colorists here. Kristy gives us the ability to be more creative on a daily basis. Matt: So that brings us to the first part of your journey into imparting all of this wisdom! 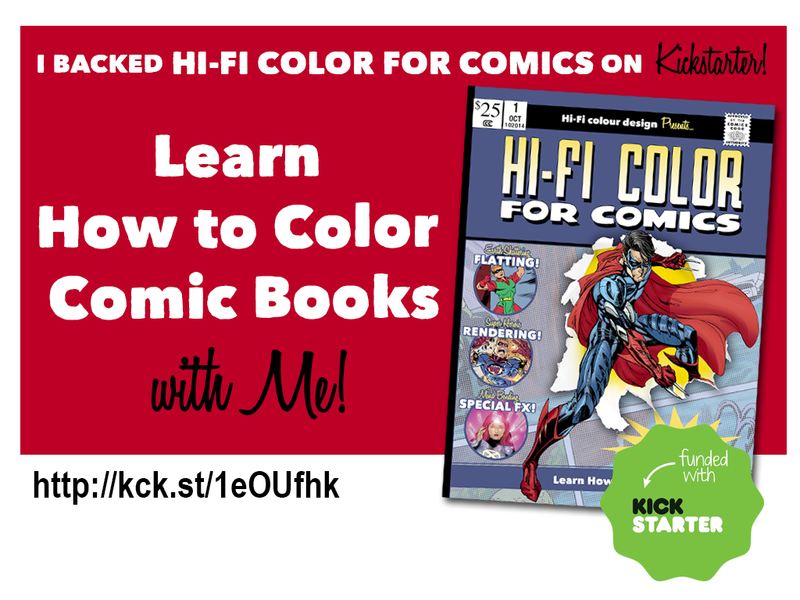 How did the first edition of your book Hi-Fi Color for Comics develop? Brian: Impact Books approached my wife Kristy and I at San Diego Comic-Con after one of our panels on How to Color Comic Books. Hi-Fi Color for Comics was released in 2008, and it quickly shot up the Amazon sales charts. Before we knew it, high-schools and colleges were buying the books and using them in the classroom. Unlike the typical Photoshop books that the schools were using that focused on the memorization of tools and their uses, Hi-Fi Color for Comics actually taught students how to create something from start to finish. I can’t tell you the number of readers who tell me, “on day one I didn’t think I could do it, then a few weeks later I’m showing people artwork I colored!” There’s no feeling like seeing someone achieve what they once thought was impossible. Matt: Assembling a Kickstarter is A LOT of work, and can seem daunting. What prompted the Kickstarter for this latest edition? Brian: When the previous edition of Hi-Fi Color for Comics sold-out, Kristy and I decided to rethink the book. We didn’t want to reprint material that was already 5 years old. I felt we owed it to our readers to update the coloring tutorials and projects. We enlisted the help of original Hi-Fi Color for Comics editor Amy Jeynes, and the three of us completely re-imagined the book from first page to last. The new Hi-Fi Color for Comics teaches aspiring comic creators how to transform black and white comic book drawings into fully rendered color illustrations, utilizing the same up-to-date tools and techniques that we use at Hi-Fi everyday coloring titles for DC, Disney, Image, & Marvel. The Kickstarter campaign is a lot of work, but it is worth it to see our friends from the industry (including Phil Hester, Mike Norton, and J. Scott Campbell) contribute amazing artwork for people to color, knowing that we will be creating the best art-instruction book for those wanting to learn the art of comic book coloring. Matt: Tell us a bit about the invectives that people can get when they pledge. 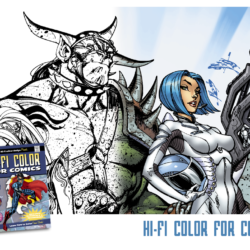 Brian: Hi-Fi fans and aspiring colorists visiting the Hi-Fi Color for Comics Kickstarter campaign will find the print edition and ComiXology digital edition of Hi-Fi Color for Comics as well as additional rewards. One thing [you see a lot of with some Kickstarter rewards] are T-shirts, key-chains, or other rewards that [just end up] driving up the cost. I wanted to ensure our reward levels were focused on teaching people how to color comic books. [To that end] we’ve include portfolio reviews, Skype tutoring, and comic coloring workshops. One of the big rewards is a 3-day coloring “bootcamp”. Imagine learning guitar from a your favorite band, now you can learn to color in our 3-day course in comic coloring. It will be a lot of hard work and a ton of fun for all who attend. Matt: So what is next for you after this campaign? Brian: Kristy and I are still working on comic book projects everyday, along with the team of colorists at Hi-Fi. Once the campaign is successfully funded, we will continue working on the new Hi-Fi Color for Comics. It will take several months to complete the book, have it printed, and ship out rewards to people all around the world. When the book ships, we will also be launching our new Hi-Fi Academy, which will be a resource for everyone who purchases Hi-Fi Color for Comics. It will offer bonus content, such as Photoshop downloads [in the form of] scripts, actions, brushes, and textures. Hi-Fi Academy will allow people to enhance their art education with new tutorials and workshops. Our goal is to teach people everything we know about coloring comics. 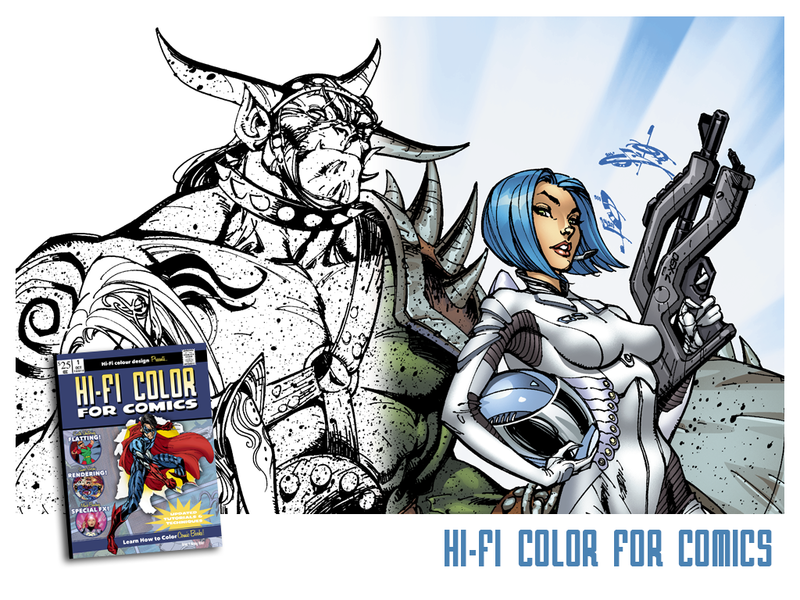 Hi-Fi Color for Comics and Hi-Fi Academy allow everyone to join us in bringing that dream to life. Matt: Besides becoming a backer of the Kickstarter, what advice would you give to people who are just starting out in the world of coloring? Brian: Working in comic books is an exciting career and you collaborate with other creative people daily while chasing after the monthly deadlines. The skills used in coloring can open doors to careers beyond comic books too, like video games, pre-visualization for film & TV, toy packaging, and more. You can also use the lessons from Hi-Fi Color for Comics to color your own artwork and tell your own stories, so if you have a web comic, graphic novel, or app you are developing, the tutorials in the book can help you make all of your creative projects stronger. The painting and coloring techniques you will learn in Hi-Fi Color for Comics will make you a stronger artist and develop within you new tools to add to your creative toolbox. Matt: Thanks for your time today and best of luck with the Kickstarter! People can learn more about it by following this link! In addition to interviewing creators and reviewing comics, Matt likes to write comics of his own, including prose short stories and novels. He is based in New York, where he lives with his beautiful wife and newborn son. Article/interview is © 2014 Matt Kelly. All rights reserved. How to Draw Comics the Marvel Way, Spider-Man, Cable, Wolverine and X-Men are TM and © 2014 Marvel Comics / Disney All rights reserved. Super Friends, Batman and Superman are TM and © 2014 DC Comics / Time Warner Entertainment. All rights reserved. GI Joe is TM and © 2014 Hasbro, Inc. All rights reserved. Star Wars is TM and © 2014 Lucasfilm, LTD / Disney. All rights reserved. Captain Crafty is TM and © 2014 Brian Rice. All rights reserved. Walt the Wildcat is TM and © 2014 Monte May. All rights reserved. Strangers in Paradise is TM and © 2014 Terry Moore. All rights reserved.